Tuscan tapestry decor displays a unique theme of Tuscan traditions with flowers, wine, vineyards, roosters and rustic country creations. You look at your tapestry and you lose the sense of time, it appears as if the clock has stopped clicking. It takes you to the journey of older days, country living and the charming 80s. 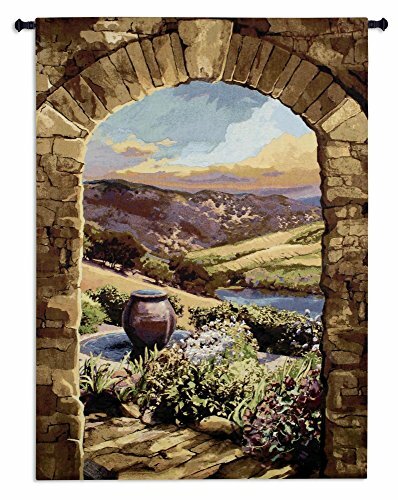 Elegant Tuscan tapestries look great with Tuscan villas, the landscapes and the vineyards. The combination of colours is breathtaking and the art transforms the ambience. 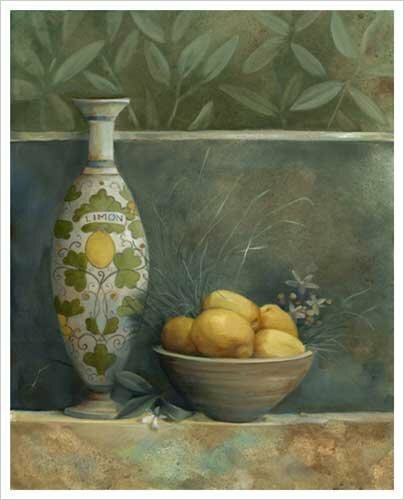 Gaze at the vivid yellow and oranges of the masonry, azure blue and greens of the Tuscan sky and mesmerizing bronze and olive green of Tuscany wines. France has a glorious history in the thriving art of tapestry. During the 14th and 15th centuries, Arras in France was a thriving textile town for its prevalent industry specializing in fine wool tapestries. The magnificent tapestries were sold to mansions and castles all over Europe. Sadly, only few of these tapestries survived the French Revolution. The majestic works of hundreds of such tapestries were burnt to recover the precious gold thread that was often woven into them. Arras is still used to refer to a rich tapestry no matter where it was woven. Most likely, the golden age of tapestry making can be traced to Paris, France during the 12th century. But the French revolution in the country forced the tapestry weavers to migrate and eventually settle down in Flanders which is now Belgium and the northern France regions. Among the oldest ancient tapestries today is the famous seven tapestry series “Apocalypse of Angers” crafted in the late 13th century. The magnificent tapestries measure 16.5 feet high and about 80 feet long, which was undoubtedly the standard during those royal times. Magnificent wall tapestries may at first thought seem like big blankets with mere pictures on it. But they can add immensely to the room’s aesthetic appeal, when you hang the Tuscan tapestry the outlook of the room changes drastically. 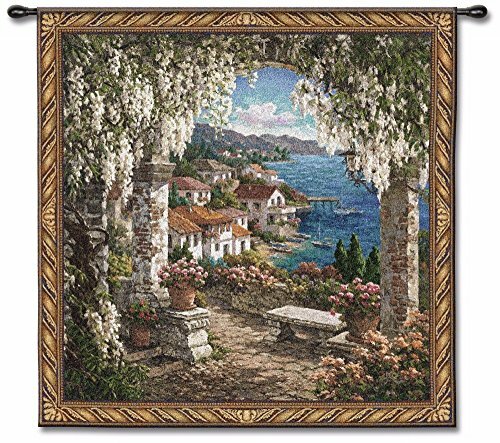 Although it has become rare for people to use tapestry decor in their rooms nowadays, more modern artworks are cropping up to give an extra dimension to the aesthetics of the room. The good old works of Tuscan tapestry art is still wonderful to highlight the room and can change the look of the room completely. 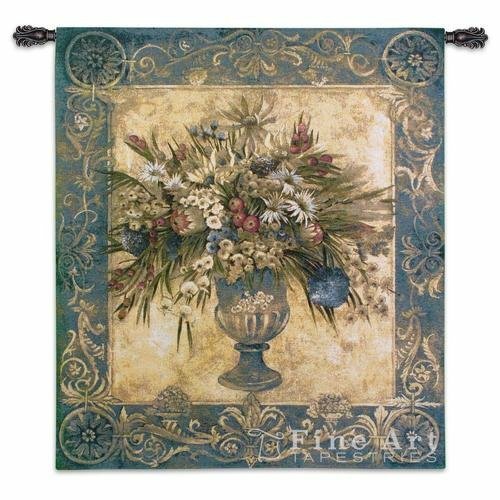 With a large bare wall and a high ceiling, the large tapestry wall hangings are the best and cheapest way to dress the room up to fill the void. 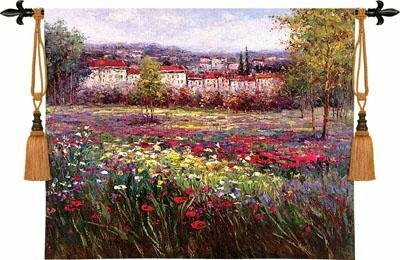 Some people would prefer to hang a painting, but buying these pieces of artwork can be very expensive. It is still possible to get matching cheap tapestry home decor of your choice though. 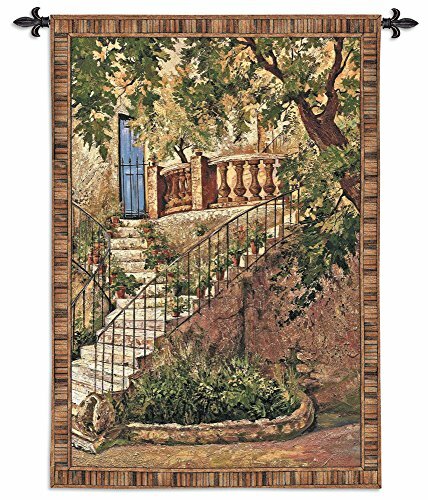 Besides, it is not often that you will find such beautiful Tuscan tapestries all time and in all seasons. 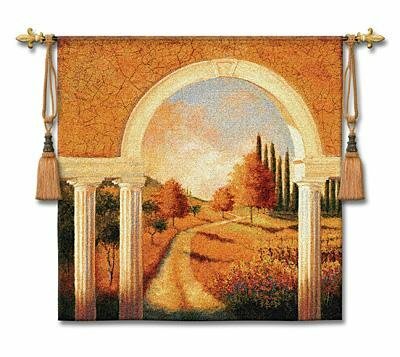 Fine Art Tapestry - 6364-WH 44"x58"
Do you love a hint of Tuscan in your home decor? I find myself completely enchanted by Tuscany - Are you too? 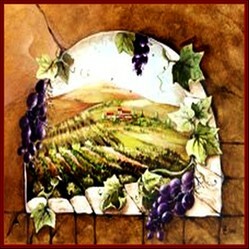 I love Tuscan design. The first one you featured looks like it would work with my Victorian board, so I'm pinning it. Absolutely! 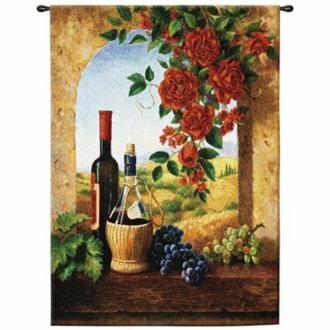 Love that part of Italy - and I love these tapestries. Thanks for featuring them. Art nouveau antiques that are a part of this revolutionary movement can give a twist to the home décor. Vintage sculptures and wall art inspired by it can add aesthetics to home. Vibrant, astounding, impressive … Make a statement with Peacock decor theme on Christmas or wedding, the effect is dramatic.